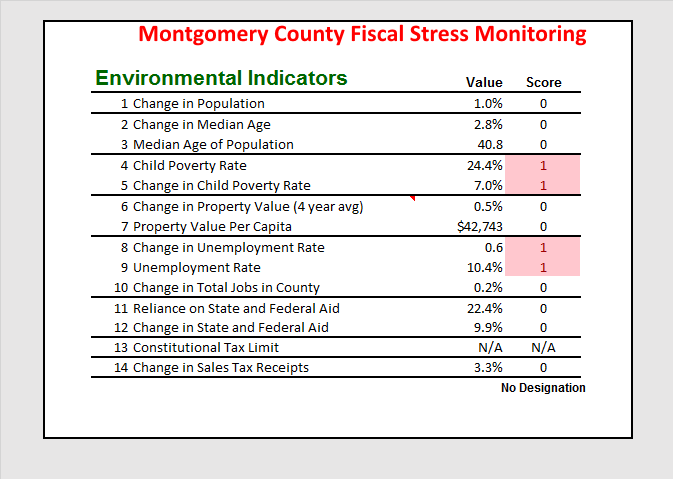 Share the post "A Failure to Pursue Growth Oriented Strategies"
I took this from the NY State Comptroller’s Office Fiscal Stress Monitoring Report on Montgomery County and to be clear: Montgomery County is not considered to be under fiscal stress. What struck me about the Environmental Indicators is not what they show but what we are doing, or more aptly, not doing in light of them. If you look over the numbers, you basically see no growth whatsoever, low income , high unemployment and a shocking child poverty rate. Given that, you would conclude that the county really needs to focus on reviving the local economy through some growth oriented approaches to counter the negative indicators along with a more active role for the state and the federal government to drive dollars into the local economy. It’s also more than clear that the county faces serious structural and systemic issues in its economics. So no matter how folks harp on cutting costs, consolidating, getting rid of waste, yadda, yadda, you see that it will not deal with the underlying fundamentals facing the county. Of course, the picture is similar for the city of Amsterdam as well. The vital political, business and economic challenge here is restoring economic growth — through public and private means, everything else is just a sideshow.